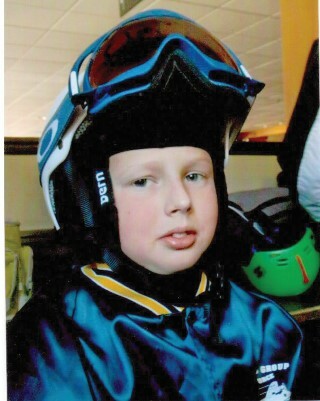 Windham High School student Hunter Loring has spent the majority of his junior year in the hospital. Halfway through the soccer season this past fall, he had to stop playing because of the pain in his back. When he no longer could walk, stand or sit, muscle relaxers didn’t work and hot and cold didn’t touch the pain, he went to the doctors. After an MRE, doctors found two cancerous tumors wrapped around the nerves in his lower back. 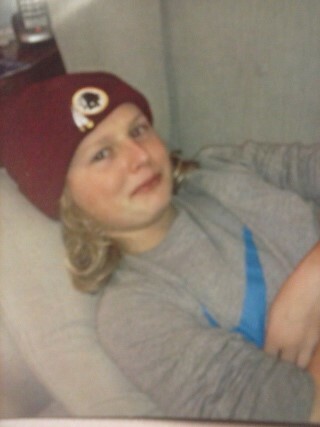 “The tumors he had were in there a long time,” said Hunter’s mom, Wendy Loring. “It has been weird from the beginning.” The tumors were taken out and tested. The rare tumor, called Myxopapillary Ependymoma, is more often found in 40- to 50-year-olds. The doctors at Maine Medical Center said they had never seen a kid with this type of cancer, Wendy said. Since the fall, Hunter has had two major back surgeries and has been under anesthesia eight times, six of those so that he could relax enough to be in the MRI machine. He is on constant pain medication and is only now able to walk 300 yards, with the medication. He started radiation to kill the cancer cells, but wasn’t able to do it consistently, so they suspended that until he could try to get his pain under control. Hunter is not able to sit in a chair or lay flat, according to Wendy. He now can sit up to 30 degrees in his bed. His family has been looking for a facility where Hunter can do inpatient pain management therapy, occupational therapy, physical therapy and counseling, all in addition to radiation. “He needs so many other things that go with the radiation,” said Wendy. Once the radiation begins he will need 24 treatments over five or six weeks. Hunter has been at Maine Medical Center’s Barbara Bush Children’s Hospital wing since January 14, unable to go home while waiting for a bed in a pediatric hospital that can meet all of his needs. He has had some of his friends come in to visit him, which he likes. He plays X-Box, but he isn’t able to keep up with his school work, nor is he able to continue participating in the culinary arts program in Westbrook. “That’s what got him to go to school,” Wendy said. Wendy, an administrative assistant in the RSU14 superintendent’s office, has had to take time off to spend time in the hospital with Hunter. She also works two other jobs that she’s had to cut back on. She has had her car packed to travel to the nearest hospital that has the care that Hunter needs since January 31. 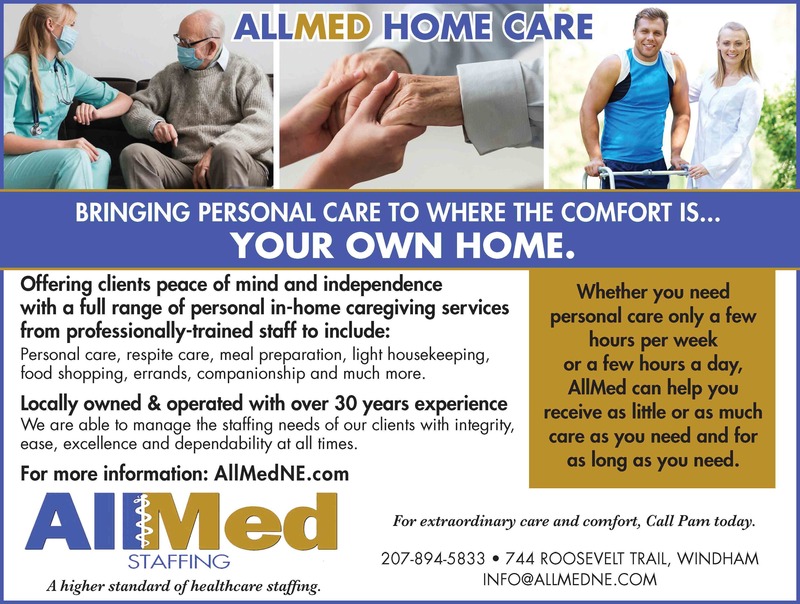 The cost of some of the rehabilitation hospitals average $2,700 a day per bed. The Loring’s have insurance, but it won’t cover the whole expense. Michael, Hunter’s father, works for Walmart’s distribution center. “It’s just exhausting,” Wendy said, of trying to keep up with work, Hunter and their oldest son, Tyler, who is 21. To help the family with the mounting medical bills, friends have arranged a spaghetti supper and auction fundraiser on March 12 from 5 p.m. to 7 p.m. at the Windham High School cafeteria. Donations will be accepted at the door. Volunteers have been stepping up and the coordinators, a group of five, have been successful in getting donations for the silent auction. The LEO Club from WHS has volunteered to put on a cake auction the same night. Kellie Sampson, Wendy’s co-worker, has taken the point in the fundraiser. She wanted to help with the dinner, “because she’s my friend and because I care about her and her family.” The hope is to raise between $3,000 and $4,000. All proceeds will go to the Loring family. “The community has really stepped up,” Sampson said. So far the auction has a large number of gift cards as well as two signed basketballs from Dave Cowens, formally of the Celtics basketball team. Other notable items are a certificate for a driver’s education class, a kid’s crooked playhouse and a crooked dog house, $500 worth of services from Designs by Gary and Arkie Rogers has donated a septic cleaning. “It’s taken on a life of its own. Everyone wants to help,” Sampson said. “It’s going to be a long, slow process,” Wendy said. “He’s in less pain because he’s on more drugs. It’s the worst thing to watch,” she added. Dealing with the chronic pain has been one of the hardest parts for Hunter. Hunter started a consultation for radiation this past week at MMC. “I’m a believer that things happen for a reason,” Wendy said. She’s hoping for the best. Donations can be made by check to Norma J. Huntley/Hunter Loring Benefit, TD Bank, NA, Mailstop, ME 2-076-031, PO Box 9540, Portland, ME 04112-9540. There is a GoFundMe page set up. 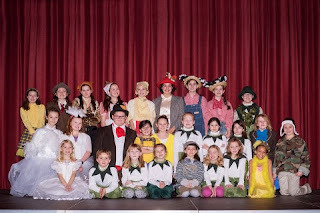 Young stars will light up the stage at Windham Town Hall gym in the Windham Center Stage production of Honk! Jr., beginning March 4th. 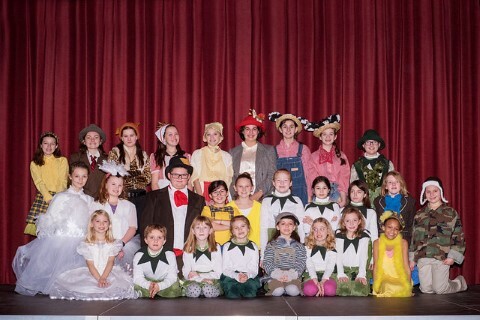 Sixty-plus lakes region children, ages 7 to 13, will interpret the classic Hans Christian Andersen tale in a modern musical style that’s fun and wholesome for the entire family. Honk! is the stage version of The Ugly Duckling that tells the story of a young duck whose unappealing looks forces him from the flock due to ridicule and taunts. Along the way he is pursued by a hungry cat and a frantic mother. His journey to find love and acceptance is filled with adventure, charm and humor. The story, which teaches tolerance, is told in part through energetic song and dance performances, thanks to musical director Patrick Martin and choreography by Jaydie Allen. The director, Diane Hancock, sings high praise for each cast of about 30 young performers. “The story is not contemporary,” and the kids are not as familiar with the dialogue and characters as they might with a Disney production. Martin says the harmonies are complex and “not really written for children.” But the casts have risen to the challenge and deliver impressive performances. Highlights include the opening Poultry Tale, where the actors introduce the story in song and dance. And Look At Him, performed by the entire cast, which is a defining moment when Ugly is singled out by family and neighbors for the way he looks – a number that is reprised in the finale. The production is enhanced by a brightly colored set: Vivid greens and browns form a comically over-sized pond, created by a team of community volunteers. Honk! is produced by Heidi Doucette and Gail White. It opens March 4 with 12 performances through March 20 at 2 p.m. and 7 p.m. Consult www.windhamtheater.org for times and cast performances. The Cumberland County Ice Fishing Derby will still take place this weekend, February 27th and 28th as originally planned along with the Maine Children’s Cancer Program’s Polar Dip at Raymond Beach at noon on Saturday, February 27th. The Sebago Lake Derby has been cancelled. At a meeting Tuesday evening with the Sebago Lake Ice Fishing Derby organizers, the Warden’s Service, IF&W and other safety personnel, the conclusion was that the unusually warm temps and upcoming rains and more warm temperatures, have created unpredictable and unsafe ice conditions to hold the Sebago Lake portion of the derby. So there will be no fishing on Sebago Lake for togue keeping our ice fishermen’s safety our primary concern. This also removes the $150,000 state record togue prize from the prize pool. Togue from other Cumberland County waters will be accepted other than Sebago, prizes for togue will be same as other Cumberland County prizes. 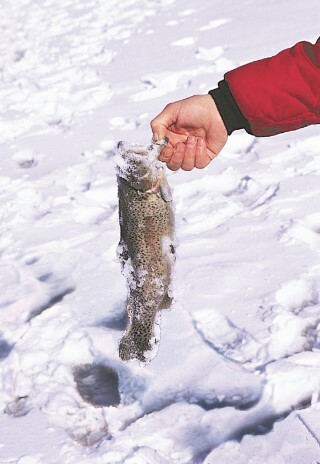 The 50 or so smaller ponds and lakes comprising of the Cumberland County derby will still be fished although the Warden’s Service cautions everyone to check the ice depth before heading out on the ice and to check it often as warm temps and sunshine can deteriorate conditions quickly. They stated that every body of water in the state has less than normal ice conditions. “We have always emphasized fish at your own risk and cannot stress enough to check ice conditions,” said derby organizers. The other fish pool prizes will be awarded, including the 2016 Polaris ATV which registrations act as an entry into that drawing. 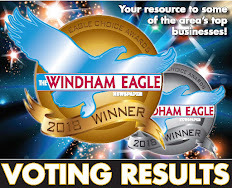 The awards and prizes will be handed out on Sunday, the 28th at Windham Weaponry’s Conference Hall at 999 Roosevelt Trail in Windham, at 6 pm. Check the website www.icefishingderby.com and the Facebook page for most up to date information. By Walter Lunt - Creative energy was in abundance at the Jordan Small School in Raymond during the first weeks of 2016. Groups of students, grades 5 through 8, were collaborating, making group decisions, writing and producing. What were they doing? Making movies – iMovies. Classroom teacher John Powers said the school-wide project is this year’s version of an annual unit that attempts to encourage students to apply classroom and personal knowledge in creative ways. He says the iMovie Project was spawned through the inspiration of a teacher in another district; an idea that has really taken off at the Raymond middle school. Students prepare to film their animated production. Here’s how it works: Students form self-selected groups and brainstorm ideas for a short film. The collaboration results in decisions, scripts, and production meetings that require leadership and teamwork. The process demands responsible group interaction, making contributions, listening to the ideas of others and above all, patience. And finally, all products have a deadline that’s expected to be met. While it’s the fun part of the project, filming, using Apple iPads, often results in the frustration of do-overs, necessary tweaking or changes, or underestimating the difficulty of an idea. The filming stage saw students spill out classrooms into halls, even into the parking lot. Norma Easter and Rainey Pawlowski were working on a stop-motion film, pointing their iPad at a hand- made city-scape while manipulating small cotton figures that represented people. They said their digital story carries a message that encourages all to “follow your own path and make your own decisions,” not follow blindly the wishes of others who seek to control you. They were joined by Joshua Marquis who, although not a member of their group, had joined to help Easter and Pawlowski edit their film. Another eighth grade student, Sophey Potter, said that, initially, she had a hard time coming up with an idea for her film but after collaborating with a family member decided to pursue one of her pet-peeves: friends and fellow students “who are always talking negative about themselves.” She said they should reflect on how they see themselves and try to be more positive. “Don’t say ‘I’m short,’ say ‘I’m fun-sized,’” Potter said with a smile. 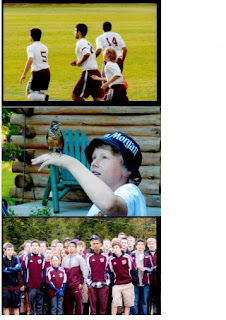 Subject matter for the films is as varied as the grade levels and number of students involved. Powers discussed one innovative project titled The Adventures of Ivan” in which the central character engages in certain every-day activities that demonstrate various principles of trigonometry. He said another was based on a student’s original poem, while still another playfully charts the life of a snowman. Last year's 1st place togue winner, Brady Ouellette. 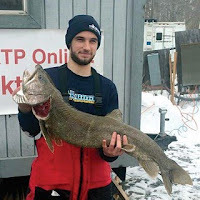 By Walter Lunt - While Mother Nature continues to tease ice anglers with changing conditions on Sebago Lake, derby director Deb McPhail says the annual mid-winter event is “still on” for the weekend of Feb. 27 and 28. Recent on and off cold has created changeable conditions on sections of the lake where ice fishers have accessed the derby, but because the high winds which prevent freezing due to churning waters have come mainly from the south, the ice just may hold at Sebago Station in Standish, according to fisheries biologist Francis Brautigam of Maine Inland Fisheries and Wildlife. The best advice is to always assume ice is unsafe, he says, so it’s best is to check conditions on the Rotary web site icefishingderby.com, which will be updated regularly as derby time draws closer. McPhail reminds participants and would-be registrants that 50 Cumberland County lakes and ponds also qualify for the derby. The option was added in recent years when lack of ice forced the cancellation of the Sebago derby. The list of eligible waters can be found on the web site. The derby, sponsored by the Sebago Lake Rotary Club, promotes family fun, fish management and local charities. 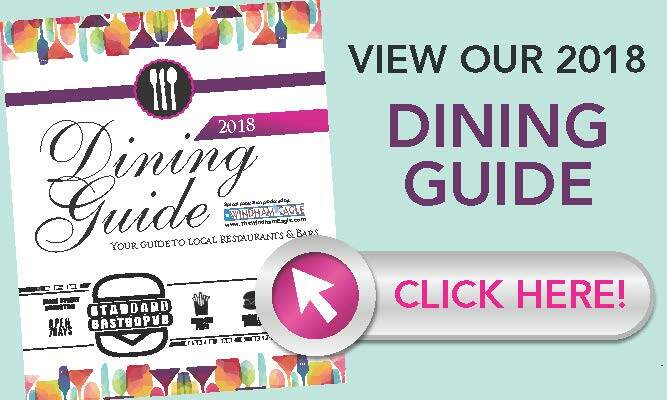 Last year, according to McPhail, $65,000 was raised, benefiting local food pantries, Camp Sunshine, scores of other organizations and local people in need. She cites rehabilitative help for a child with multiple sclerosis and a ramp that was provided for an amputee. The polar dip, in which brave souls jump into frigid Sebago water, raised thousands of dollars for Maine Children’s Cancer Program. Ice fishers compete for cash prizes and the unique recognition of pulling in the largest fish in the area. The four species include togue (lake trout), pike (invasive), perch and pickerel. Prizes range from $100 to $1000 for trophy fish. The grand prize this year totals $150,000 for the angler who bests the state record for togue, which now stands at 31 lbs. 8 oz. set in 1958. In addition, all registrants, whether fishing or not, will be eligible to the win the drawing for a 2016 Polaris Sportsman 570 ATV. Details concerning the Sebago Lake Rotary Club Ice Fishing Derby, including the children’s derby to be held in March, can be found at icefishingderby.com. By Elizabeth Richards - A hearty group of outdoor enthusiasts came together on Maine Great Outdoors Weekend for an Animal Tracks program put on by the Presumpscot Regional Land Trust (PRLT). On Saturday, February 13th, the group met at the Hawkes Preserve in Gorham for a one-mile snowshoe around the new nature loop trail. Though the day was cold and windy, almost two dozen people gathered to take part in the program. Master Naturalist Karen Herold and PRLT Executive Director Rachelle Curran Apse led the family-friendly trek, stopping frequently to discuss tracks in the snow and how to identify the wild creatures that had recently been traveling that path. A wide variety of tracks showed evidence of the many creatures who share the land at the Hawkes Preserve, including mice, squirrels, deer, otter and mink. The trail winds its way through the woods behind Great Falls Elementary School and along the Presumpscot River. The one-mile nature loop trail was developed in partnership with the school, said Curran Apse. The school uses the trail with students in the spring and fall. A pamphlet guide details six marked stops along the path. The brochure offers a brief description of what visitors can expect to see at the stop, including the shoreline, specific trees and plants, and a small wetland area. The Animal Tracks program was one of many events put on by the non-profit PRLT, which manages just over 1000 acres of land on 20 preserves in Presumpscot River Watershed. The goal, said Curran Apse, is to offer a program every month, to get people out enjoying and learning more about nature. “We’re focused on finding, preserving and protecting open space for wildlife and for public recreation,” said Curran Apse. This includes creating trails, and seven of the preserves are free and open to the public for recreation. “We want people to get out and enjoy nature on them,” said Curran Apse. 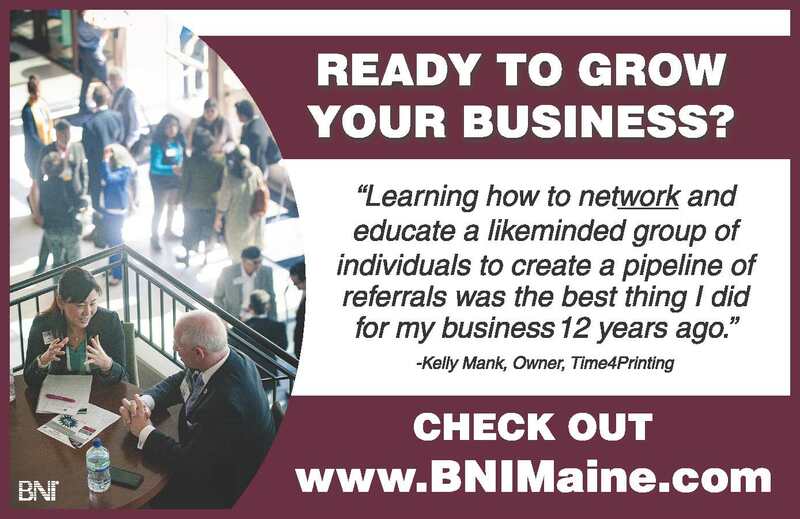 “That’s why we’re doing more programs, to make sure people know about them. We hope that after programs like this people come back on their own and keep enjoying them,” she said. The PRLT is in their 30th year as an organization, and has had many exciting new recent developments. One is their closure on the Randall Orchard preserve. This is a conservation easement, meaning that although the land is still privately owned by the Randall family the 500 acres will always be protected as farm and forest, and will never be subdivided. Their newest preserve is the Millbrook preserve in Westbrook. 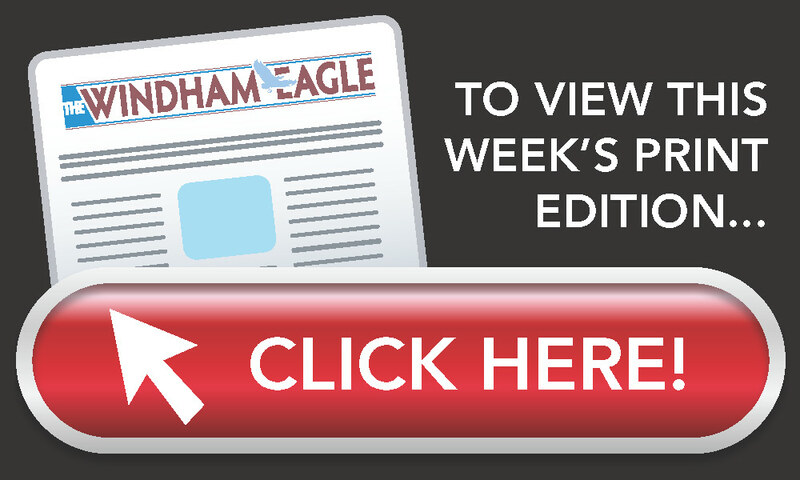 “What is really exciting about it is that thanks to the dam being removed on the lower Presumpscot about a decade ago, migratory alewife now come from the ocean up Millbrook to Highland Lake and spawn,” said Curran Apse. “Putting a preserve on there and putting in a trail is going to allow people from the region to come and see this amazing migratory fish.” Although a trail won’t be completed until this summer, a program is planned at the reserve for World Fish Migration Day on Saturday, May 21st. 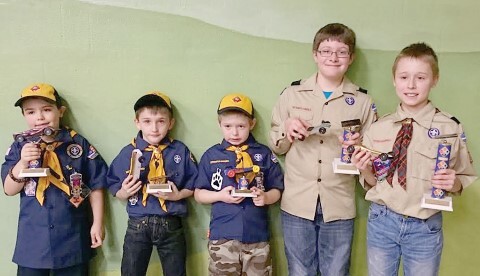 Cub Scout Pack 805 held its annual Pinewood Derby, where Scouts from first grade to fifth grade race cars made from a block of wood. Each car has to weigh five ounces, have plastic wheels and fit within certain parameters. The cars are only limited in design by the imagination of the boy creating it. This year there were many Star Wars themed cars, a hot dog, a police car, thin cars and even a football field. The speeds are clocked by computer, eliminating human confusion. This year’s winners were first place Alexander Momot, second place Joseph Lopes, third place Calvin Bartz, fourth place Wyatt Richards and fifth place Jacob Spencer. Trophies were also given to best in show for each age group (called a den) and one over all winner.